The first in my series is a little known but spectacular National Park that’s pretty much in my own backyard. 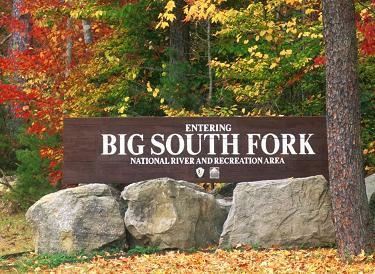 In roughly three hours I can be at the gates of Big South Fork National Park on Tennessee’s Cumberland Plateau. I’ve visited many times but there’s still a tremendous amount left to explore. This is a Park with incredible diversity. Every corner has something to offer, be it geological, forestry and wildlife, or a substantial river system. Recreational opportunities are endless…from camping, rafting, hiking, and scenic photography…to mountain biking, horseback riding, backcountry adventures, waterfalls, and miles of astounding gorges and sandstone cliffs. Ok, so that’s the official spin and it’s all true. I could write a book on all the recreational possibilities (wait, someone already has, I bought it) but my article is geared toward the casual explorer, the day hikers, folks that just enjoy spending time outdoors. Big South Fork has so much to offer that I couldn’t possibly try and cover them all. Rather, I’ll single out three things that I’ve really enjoyed in the Park. One of the more popular hikes and my personal favorite. There are several sandstone arches in the park and they are all amazing to see, but there is only one double arch. The Twin Arches are beautiful and imposing, not to mention the only of its kind east of the Continental Divide. Access is located on the western side, a gravel road entrance that’s off of Hwy 154 and not far from Pickett State Park (TN). The hike to the arches is a two mile trek round trip and though not difficult, there are a few challenges. First, the going in has a fair amount of downhill, which means the way out has a fair amount of uphill. Not horribly so, but you feel it. The next (about halfway in) is a rugged log staircase, not long, but steep and single-file. It requires a bit of agility. The only other challenge is optional and at the arches themselves. The Twin Arches are two natural sandstone formations that connect in the middle. One is 70 feet high, the other 90 feet. You can climb a normal wooden staircase to the top for the view and believe me, it is well worth the effort! Just don’t get too close to the edge, there are no guard rails and it’s a rather long drop. Should you prefer to keep it at ground level there’s still much to explore and several other trails intersect here. You can crawl all around the base of the arches and if you’re brave enough there’s a dark and spooky crevice where the two meet and an adventurous soul can slip through to the other side. 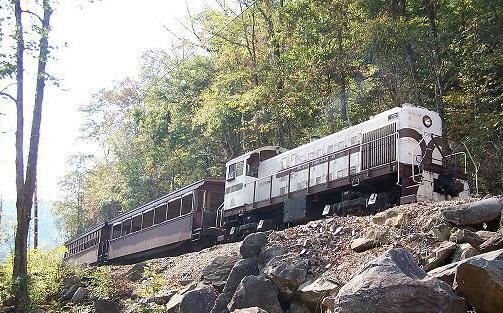 Big South Fork Scenic Railway runs out of Stearns, KY (eastern side of BSF on Hwy 27) and offers several different rides that vary by length and location. One of the more popular and scenic rides takes you deep into BSF until you reach a historical mining ghost town. Back in the 40’s and 50’s it was a working coal mine, but now it’s dormant and preserved for folks to explore the grounds and buildings. Plus they pack in a deli sandwich lunch. And that’s only part of the fun, the train ride itself is amazing. Their passenger boxcars have open sides so nothing blocks your view. You get to experience traveling through a mountain tunnel, cross an old railroad trestle, and get so close to forest or sandstone bluffs it seems like you can reach out and touch them. Plus there are countless breathtaking views to enjoy. They run year round, but I like going in autumn for the fall colors. There are only three highways that bisect the Park, but they offer miles of spectacular scenic opportunities, several points of interest, and overlooks. 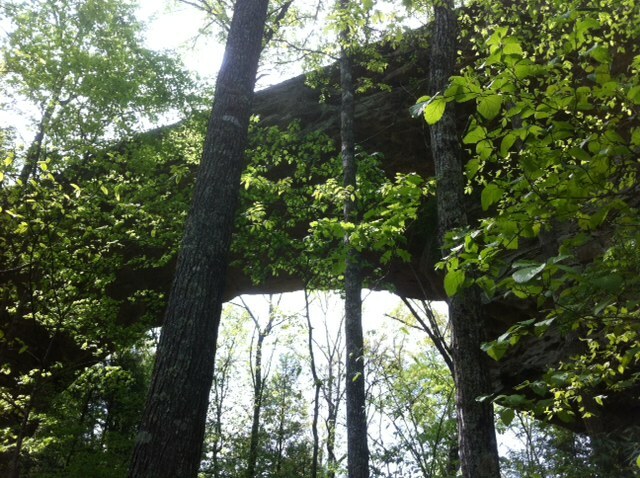 Highway 297 is the main one, the longest, and the most challenging as it runs right through the Big South Fork River Gorge. There are steep grades (up to 13%) and sharp hair-pin curves that aren’t for the faint of heart. But the views are truly awe-inspiring. Yahoo Falls, Devils Jump, and East Rim overlooks are accessible by car, but there are countless others that can only be reached by hiking or horseback riding. Bandy Creek Visitor Center is on Hwy 297 as well and they have an interesting little museum and gift shop. There are also several river access points and overlooks nearby. The park operates in two time zones. Eastern and Central and the time Line runs through the middle of the park. It’s important to note that most of the park offices and concessionaires operate on Eastern Time. There are only two visitors centers – Bandy Creek in TN toward the southern end of the park on TN Hwy 297. It’s appx 15 miles west of Onieda, TN. And Blue Heron in KY near Stearns on KY Hwy 27 where the train ride is located. 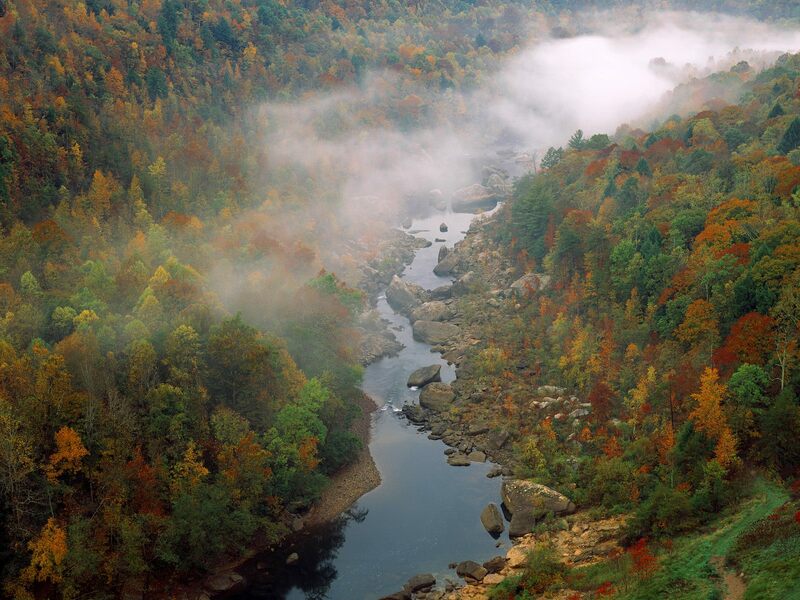 Big South Fork is truly a four-season park. Spring, summer, winter, and fall each offer different views and aspects for people to enjoy. So no matter what time of year you want to visit, there is something to see and do. Cultural Preservation is strong in the park and there are many rock shelters scattered throughout that were used by pioneers and moonshiners alike. There are also archeology digs as BSF has a strong fossil record currently under study. Always be on the lookout for wildlife. Especially bears. There’s a bunch of them roaming in the Park. Hunting is allowed inside the park too, so if you plan on visiting the back country in fall or early winter make sure you wear bright colored clothing.